For ones who travel around often, would desire to learn new language in a quick manner. Learning a new language has a number of beneficial features within it, where the individual gets to know the culture, enhance brain performance, and also gain career opportunities. People often mistake that learning a new language is a time consuming task, but the reality is that it does not take years to learn a language. Though it may be tough to learn a new language fast , there are many tips and techniques to learn any language fast. As a learner you should have a strong and specific reason to learn the language. When you do not possess valid reason then you are less motivated in the learning process. A good reason is not impressing English speakers with French but impressing French speakers in their own language. Irrespective of the reason, it is important to commit once you have decided. When starting to learn a new language it is mandatory to know the style of learning you possess. Each individual has a varied way of learning when it comes to their part of learning a new language. Each may have a varied style; some may write repeatedly, some may learn by means of repetition or by listening to a native speaker. Find out if you’re a visual or a auditory learner. You can do this by choosing a few number of words and reading them repeatedly. If you are able to remember them the next day, then you’re a auditory learner. If this trick does not work just read and write them a number of times. 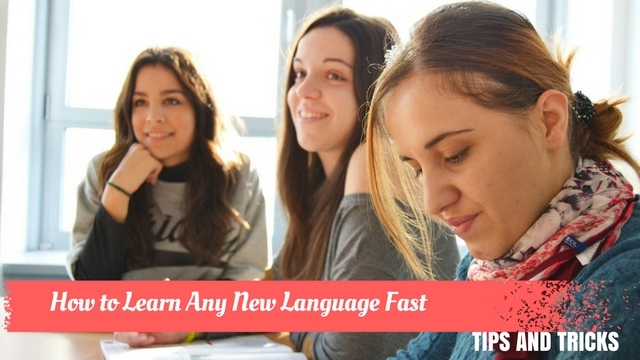 The best way to learn a new language is to speak it often with a native speaker or a partner. This way they put into use the language they have learned, so apart from memorizing words and learning grammar, it is mandatory to speak in the same language with others too. You would feel motivated more when you speak with a real person rather than in a book or a computer. One of the best ways to practice the language is to talk to you for a number of times and practice it. Make sure to use new vocabulary words each day, this can be best idea rather than memorizing many words at a time. Try to incorporate the vocabulary into your daily routine, by this way these words can be committed to memory and can also be used for real life scenarios. It is always a good idea to have a notebook with you and note down words which you do not understand. By this way you can find out meaning and the real word and use them in your daily life. There are many people who might have studied the language a number of times but would not be fluent or master the language. This is because they might have studied the language only for a couple of days in a week. It is really important to learn the language every day. Repetition is the main aspect which makes you learn the language hence reading every day is mandatory. You can save more time, avoid frustration when you carry a dictionary with you all the time. The dictionary can be an online or mobile dictionary or a physical dictionary; this helps you to find the meaning of the word immediately once you need to know a word. With the help of a dictionary, you can also get to learn more number of words per day. The language may have the same category of words of your language but they do not have the same way of pronunciation. Pronunciations differ for other languages and hence learning the pronunciations is important. Audio recordings and online language materials are few ways by which pronunciations can be learned. There are number of ways by which you can learn a language quickly, in that manner online assistance is a great way. There are many language apps and other programs which assist you in learning the vocabulary in a quicker way. Also there are many flash card creators for free with which pre-made decks can be made which are mandatory for your language. You can also opt to study the language on a computer or through apps in your smartphone. Confidence is an important parameter which assists you in learning the language fast. People think that they may go wrong while using the new language, it is important to clear your heads and open your mouth in using the language. Make use of all the techniques which makes you feel comfortable and confident. It is evident to make mistakes in the process of language learning, hence make an effort to communicate with the language, though you may make a mistake. All the activities that you do with your native or mother tongue language are to be done with your new language too such as reading, writing and listening. The best ways can be watching television and TV shows or movies in the new language. To make it more easy, it is good to watch movies which you have already familiar with. It is also equally important to read and write the new language. Reading one article per day from newspaper is also necessary in order to get used to the language. Make use of the new language in the radio stations, by this way individuals can listen to comprehension and also learn the pronunciation of the new language. In the same manner your mobile language can be changed and used. Listening to songs in the new language and learning the lyrics can be useful to learn and converse too. It would be of great advantage and a boosting factor to visit the place where your language is spoken. By this way you can interact with the locals and get to learn the language fluently. Also you can implement your learning of new language in the place in the stores, or while asking for direction etc. Do not worry about your oral skills, keep speaking and you will notice a great improvement in grammar, vocabulary and pronunciation. Grammar is an important part of learning the new language apart from vocabulary, hence paying attention towards grammar is important. It is mandatory to look at the language structure and how it really works. Once you start learning the language it helps you know how it fits in. Also make sure to have a clear understanding about how to express a question, negative statements, past, present and future tenses too. The new language which you have chosen may have different alphabetical system, hence getting to know all the alphabets is necessary. The format of the letters how they look and operate is to be understood. It would be a good trick to link each letter with an image and sound. The words which you’re trying to learn and retain can be done so when you’re able to listen to the new language more number of times either through audio courses, movies, etc. along with listening, you need to repeat the words and speak them out continuously. This is a beneficial technique called shadowing and is used by many polyglots. Try to use your headphones and keep listening to these words all the time. Keep repeating the words loudly and clearly so that you get with the language fast. Audio books and audio language lessons are another great way by which you can make your listening interesting. It would be a good habit to get to the library and start reading with simple books first, later on move towards difficult and challenging ones. Choosing children books are one of the great ways to start learning the language, as they are books which are meant to teach children about how to learn and speak the language. When you learn a new language and trying to get to that place, make sure to memorize all common words and basic sentences you need to speak. Such as my name is, the direction for a particular place, etc. Mnemonics and memorizing techniques can be used to memorize words. The best and productive way to learn a new language is to schedule you list of activities. Get started with your google calendar and list your activities of learning your language. Daily repetition of review, reading, writing, and studying can help you excel in the language very quickly. Usually top performers have coaches to help them succeed in their field so that they guide them in each step throughout. There are limitless benefits by having a coach but the key benefits are that there is more productivity, accountability, motivation in order to achieve your objectives in a quick way. A coach is always a best choice as they help you in each step and see your success. A language coach can help you speak in a fluent manner, offer immediate feedback, provide you with the right exercise as per you skills and correct you at the right time. By this way any language can be learned faster and quicker. It is usual that there would be lack of maintenance in the language learning process. In that manner a coach is the best person who can help you maintain and enhance your language learning skills. The length and hours of study can be decided by the learner whether its everyday or 2-3 hours a week. Language requires more of reference experience and repetition in learning process. It is also mentioned as an investment and commitment towards learning. Hence allocating a specific period of time for learning a specific language is mandatory. It is good to start off with the most common words which you use in your daily schedule as they can help you converse soon. This must be accompanied with grammar and must be done until you’re comfortable with speaking the language. When more of intellectually intensive work is done for hours, your brain feels gravy at some point. While learning languages the same must happen, where effort and time must be maximized during your learning sessions. There are ample websites where there are a number of foreigners who wish to learn specific language. These people practice online with their new language, which you can also try for. These are a few hints which can be followed for ones who desire to learn new language quickly. It is their individual effort and interest in learning the language; hence they should get involved fully in order to learn the language. There are a number of online resources which can be utilized in order to read, write, listen and discuss with other learners like you. Moreover there are tests, which are conducted online too, which tests your skills and where you stay. For ones who visit new countries often or for ones who have a passion to learn a new language can schedule their daily calendar and start learning their language quickly. These tips along with hard work are sure to help you learn the language quickly within scheduled time. The resources required for learning and dedication are the only tools to learn and excel in a new language.